Your ordinary blender will perhaps give you half the nutrition from your meals and the other half is often compromised. Have you wondered if your blender is worth the efforts in making meals or not? If you have been contemplating on the nutritional quotient of your meals, the Nutribullet Rx is the perfect solution for all your needs. It is not for nothing that it is labeled as the world’s most powerful nutrient extractor. We will take a detailed look at the best features of this powerful blender and then review its advantages over competition. This blender consists of 10 pieces and has incredible features that are bound to make it all worth the money invested. It far exceeds the potential of standard blenders and juicers. It has the ability to transform ordinary food into irresistible and extraordinary forms of nutrition. The NutriBullet Rx is by far the most powerful machine available in the market. It has a high torque power base of 2.3 horsepower that draws out the maximum amount of nutrition from vegetables and fruits alike. The end product is smooth and filled with nutrition that you can serve your family with satisfaction. The NutriBullet Rx parts are designed to function without you needing to intervene at each step of blending. Its revolutionary hands-free SMART technology helps start the blender automatically. It blends your fruits and veggies for the exact amount of time and speed. The extracted drink delivers optimal nutrition to your family members. There is a G-Button located at the front of the blender that can be pressed to activate the soup making mode. This mode is a 7-minute heating cycle that can offer you hot, piping, nutritionally-rich soups and beverages. The NutriBullet Rx twist-on blade is highly powerful and fits all Rx vessels without any trouble. You can add whole fruits and vegetables for juices and soups and it will blend them in without eliminating the necessary fiber and nutrients. The blender has a SouperBlast Pitcher with a lid containing two pieces. This can be used to extract ingredients in the soup-making mode. The lid of this pitcher is vented that allows the escape of heat and pressure while making soup. The spout of the pitcher allows easy pouring of the soup into the serving bowl. Yet another feature of this blender is the 130 ounce short cup. This short cup comes along with the blender and also has a comfortable lip ring on its rim to allow easy sipping. Along with the short cup, the NutriBullet Rx also comes along with a 145 ounce oversized cup that is extremely convenient to make extra large or multiple servings of your favorite beverage. When you need to carry your juices or other beverages to work, the Stay Fresh Re-sealable lid fixes onto the short and oversized cups easily to keep your drink fresh and warm for a long time. There could be instances in which your Extractor Blade does not come off the cups. The blade remover that comes along with the NutriBullet Rx easily removes the blade and safely untwists it. As if the primary features were not enough, the blender also comes along with a Nature’s Prescription recipe book with all the NutriBullet Rx recipes that you could think of making in the comfort of your kitchen. It contains 150 pages of information and recipes, ranging from soups, beverages to other delicious concoctions. It also describes how nutrients specifically impact our bodies in different ways and how they fit our unique health needs. While everything about the blender is perfect, there are a few users who have reported a problem regarding the gasket of the NutriBullet Rx. If you overfill the cup, it creates suction and pulls on the gasket. It is recommended that you do not overfill the cup or run it for longer than a minute. A replacement assembly with a new gasket is a possible solution for those who have experienced this problem. How is the NutiBullet Rx better than its competitiors? Without taking names, it is evident that with a horsepower of 2.3, the NutriBullet Rx is clearly more powerful than other blenders available in the same price range. It makes your smoothies absolutely delicious without the presence of lumps or irregularities in them. Unlike other blenders that need you to devote a good amount of time in setting speed and time before, during and after the blending is done, the NutriBullet Rx uses a SMART hands-free technology that starts automatically. It also extracts your beverages while running at the exact speed for the exact amount of time. It saves time and energy spent in adjusting the settings of a blender. While a lot of blenders can claim to make soups in a few minutes, the NutriBullet Rx reviews will show you that there is no nutrition lost while it blends fresh soups for you. It extracts the maximum amount of nutrition and keeps it intact by not eliminating the essential fiber and nutrients from your food sources. Most blenders eliminate the fiber and keep the less nutritional element for your consumption. In most blenders, you will need to peel and chop your fruits and vegetables for the best possible results. The NutriBullet Rx blends whole fruits and veggies to extract fresh juices and beverages for you. You will neither need to spend time peeling them nor chopping them into pieces. More than half your work is taken care of. 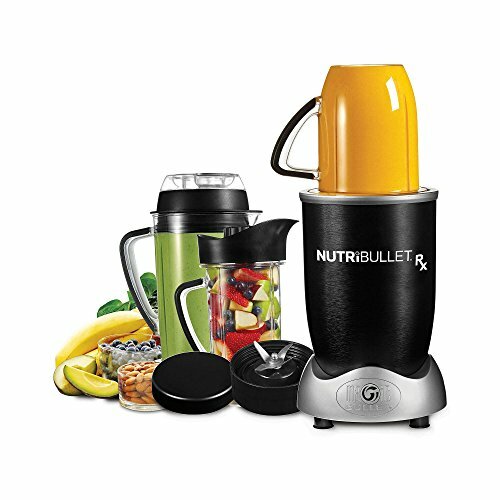 This is a unique feature of the NutriBullet Rx because not many blenders in this price range could feature such an important aspect. Extractor blades seem to get stuck on the sipping cups and it becomes troublesome to remove the blade without getting hurt in some way or the other. With the blade removing tool at hand, you can easily remove the extractor blade and untwist it safely. Some blenders make the best juices while some others make the best soups. A blender like this one that makes everything, from sauces, dips, soups, juices and other beverages in a jiffy, is definitely worth an investment. You can literally transform raw veggies, nuts and fruits of all kinds into whatever form of fluid you want to. With a powerful machine like the one it has, the NutriBullet Rx is bound to be exploited to its maximum potential. When blenders are used for high-level blending, they tend to wear out faster than their counterparts. This NutriBullet Rx parts are designed to last for a long time without giving you any kind of trouble. The fact that the NutriBullet Rx gives you smooth beverages while keeping the nutritional value intact, makes it all the more popular. The fiber is not eliminated and you get to extract the maximum amount of nutrition from your meals. If you have been rather concerned about offering soups and juices to your toddler because there is hardly any nutrition in there; try the NutriBullet Rx to revolutionize your meal ideas. 1.1.1 Free Download: [PDF]NutriBullet manual. 1.3 How is the NutiBullet Rx better than its competitiors?